UNU-MERIT » Robust Peacekeeping: A Necessary Evil? 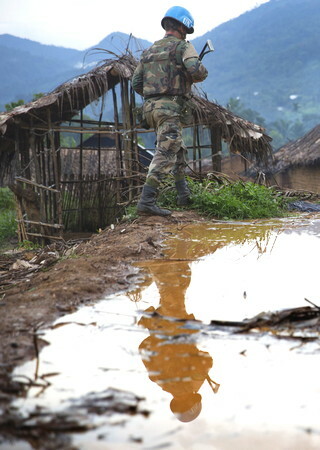 Robust Peacekeeping: A Necessary Evil? The use of force in UN peacekeeping has sparked heated debates in academic and policy circles alike. After the tragedies in Rwanda and Bosnia & Herzegovina, the UN Security Council authorised the use of force not only in self-defence but also in defence of the mandate. Thanks to the Brahimi Report, today’s peacekeeping operations usually include civilian protection in their mandates. However, there is some concern about the expansion of offensive force. For example, in 2013, the UN Security Council adopted Resolution 2098 (2013) to supplement MONUSCO with a specialised intervention brigade, mandated to neutralise and disarm rebel groups (paragraph 12b). The trend towards ‘robust peacekeeping’, which involves the use of all necessary means to deter forceful attempts to disrupt the political process and maintain law and order, is not well-received by all. For example, there are active debates surrounding the legal legitimacy of the use of offensive force, the principle of impartiality of peacekeeping, and the safety of peace workers, to name but a few. Yet a more fundamental question is often forgotten: is robust peacekeeping really necessary? In other words, are there policy alternatives that can achieve our goals while avoiding the legal, moral and political dilemmas of robust peacekeeping? Because the practice of robust peacekeeping varies considerably not only across but also within operations, and until now only few cases exist, it is difficult to evaluate the practice and give policy recommendations. In what follows I will infer policy implications based on predictions from a popular theory in international relations: the security dilemma. Consider the following scenario: a conflict has reached a point where no actor sees any chance of defeating its opponent(s). The warring parties agree to lay down their arms. As they agree to a ceasefire, we know that they value peace more than the continuation of fighting. However, the parties still mistrust each other and worry that they would suffer a loss if the other party attacks while they are laying down their arms. This creates a dilemma for both parties. On the one hand, they prefer peace to war. On the other hand, a unilateral ceasefire will benefit the violator but put the party complying with the ceasefire in a vulnerable position. In this scenario, temptation and risk-aversion are two strong motivations that can drag parties back to the battlefield. What can the UN do in this security dilemma to prevent the parties from going back to war? Harm reduction: peacekeepers may arm themselves to separate the two parties or to defend the complier. Offensive force: the UN peacekeepers may defend the operation by disarming or inflicting a military blow on the violator (as per the mandate of the MONUSCO intervention brigade). This policy option is in line with the proposal of robust peacekeeping and enables peacekeepers to attack the violator when necessary. Peace dividends: the UN can increase the peace dividends and offer both parties more incentives to stick to the agreement. For example, this can be done by providing development assistance to the country, conditional to the maintenance of ceasefire. Game theory predicts that the outcome of continuing fighting is fairly stable. No single policy option mentioned above can help the parties avoid this outcome because there are two culprits in the dilemma: the temptation to attack and the aversion to risks. The good news is that there are two policy mixes that can uphold a peaceful solution as the only equilibrium outcome: (i) mixing harm reduction with offensive force, and (ii) mixing harm reduction with peace dividends. This essentially says that, to escape the conflict trap, peacekeepers need to both incentivise the parties to observe the agreement and persuade both parties that the peacekeepers would act accordingly once violations occur. In this way, peace becomes a desirable outcome to which both warring factions are likely to stick. 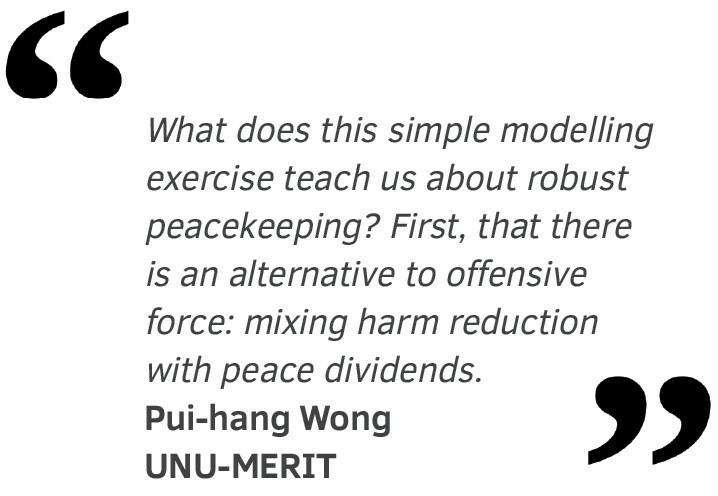 What does this simple modelling exercise teach us about robust peacekeeping? First, that there is an alternative to offensive force: mixing harm reduction with peace dividends. But there is a caveat. When seeking to enhance peace dividends, the increase should clearly outweigh the potential gains from violating a ceasefire. Failure to do so can lead to the worst outcome: of having one party in compliance and the other party in violation. Better protection can make either party more willing to comply with the agreement, but the temptation is still there. Second, that when the UN mixes harm reduction with offensive force, the choice to comply is based on the disincentive of incurring a blow inflicted by the UN. Even if the UN fails to make the threat credible, the worst that can happen is a return to the status quo. That is, the dilemma endures as if there were no intervention. But unlike the alternative, this policy mix does no harm by aggravating the security situation as the most undesirable outcome discussed above — i.e., the unilateral offensive — can be avoided. All in all, robust peacekeeping is not the only game in town, so is not strictly necessary. But it can save the great risks incurred by all the alternatives. 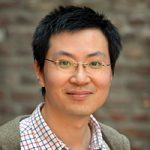 Pui-Hang Wong is a PhD Fellow at UNU-MERIT and its School of Governance. His research interests include civil war settlement, political violence, and development. His PhD research surrounds the use of development assistance in counter-insurgency, peacekeeping, and state-building strategies in a post-conflict setting.